Mark Halperin, you should probably know better. Copyright confers a limited monopoly; monopolies are by their nature unhealthy, so the law (and in this case, the Constitution as well) limits them. As a result of the Sonny Bono Act, copyright term is now far in excess of (current) human life span, so what's the beef? If you want the asset you have created to produce income for unborn generations, invest your earnings wisely, and buy a form of property (try real estate, always a sound investment -- and it's a buyer's market right now) that neither the law nor the Constitution have yet limited. The case for a limited term of copyright makes the most sense when one considers that the kernel of genius behind the Copyright Clause to the U.S. Constitution was that the framers understood that a new nation (and consider our nation is still "new") needed a context where authors and inventors could receive an incentive to create and invent new things so the product of their work would enrich society. They would be rewarded and when the limited term governing these grants of monopoly rights ended, these new creations would be usable as platforms on which the next round of inventions and creations would stand. And the cycle would repeat down the years. The framers' vision in this was sound. Look at those works that depend on what has gone before; the quality and depth of what we create would be diminished if the bank on which we could draw was limited. The copyright doctrine of fair use provides some relief, but not enough, and a mindset that equated a short-story with a piece of real estate would impede creativity with no offsetting benefit to society. A Great Idea Lives Forever. Shouldn’t Its Copyright? WHAT if, after you had paid the taxes on earnings with which you built a house, sales taxes on the materials, real estate taxes during your life, and inheritance taxes at your death, the government would eventually commandeer it entirely? This does not happen in our society ... to houses. Or to businesses. Were you to have ushered through the many gates of taxation a flour mill, travel agency or newspaper, they would not suffer total confiscation. Once the state has dipped its enormous beak into the stream of your wealth and possessions they are allowed to flow from one generation to the next. Though they may be divided and diminished by inflation, imperfect investment, a proliferation of descendants and the government taking its share, they are not simply expropriated. That is, unless you own a copyright. Were I tomorrow to write the great American novel (again? ), 70 years after my death the rights to it, though taxed at inheritance, would be stripped from my children and grandchildren. To the claim that this provision strikes malefactors of great wealth, one might ask, first, where the heirs of Sylvia Plath berth their 200-foot yachts. And, second, why, when such a stiff penalty is not applied to the owners of Rockefeller Center or Wal-Mart, it is brought to bear against legions of harmless drudges who, other than a handful of literary plutocrats (manufacturers, really), are destined by the nature of things to be no more financially secure than a seal in the Central Park Zoo. It is, then, for the public good. But it might also be for the public good were Congress to allow the enslavement of foreign captives and their descendants (this was tried); the seizure of Bill Gates’s bankbook; or the ruthless suppression of Alec Baldwin. You can always make a case for the public interest if you are willing to exclude from common equity those whose rights you seek to abridge. But we don’t operate that way, mostly. Furthermore, one should not envy the perpetrators of sensationalist trash, but rather admire them, in the hope that someday, somehow, without prostituting, debasing and degrading oneself while recklessly destroying what is left of the literary culture, one might enjoy a fraction of their wealth. They represent, however, only a small fraction of writers, and their good fortune is a poor excuse for seizing either their property or that of their leaner colleagues. And Barnes & Noble is able to publish price-reduced non-copyrighted works not so much because it saves the 10 percent to 15 percent of revenue that would go to the gruel-eating authors, but because it saves the 50 percent that would go to the publishers. Booksellers that publish their own titles benefit not from escaping the author’s copyright, but the previous publisher’s exercise of a grant of rights (limited, authors take note, to 35 years). “Freeing” a literary work into the public domain is less a public benefit than a transfer of wealth from the families of American writers to the executives and stockholders of various businesses who will continue to profit from, for example, “The Garden Party,” while the descendants of Katherine Mansfield will not. Absent the government’s decree, copyright holders would have no exclusivity of right at all. Does not then the government’s giveth support its taketh? By that logic, should other classes of property not subject to total confiscation therefore be denied the protection of regulatory agencies, courts, police and the law itself lest they be subject to expropriation as payment for the considerable and necessary protections they too enjoy? Should automobile manufacturers be nationalized after 70 years because they depend on publicly financed roads? Should Goldman Sachs be impounded because of the existence of the Securities and Exchange Commission? But ideas are immaterial to the question of copyright. Mozart and Neil Diamond may have begun with the same idea, but that a work of art is more than an idea is confirmed by the difference between the “Soave sia il vento” and “Kentucky Woman.” We have different words for art and idea because they are two different things. The flow and proportion of the elements of a work of art, its subtle engineering, even its surface glosses, combine substance and style indistinguishably in a creation for which the right of property is natural and becoming. And in Jefferson’s era 95 percent of the population drew its living from the land. Writers and inventors were largely those who obtained their sustenance from their patrimony or their mills; their writings or improvements to craft were secondary. No one except perhaps Hamilton or Franklin might have imagined that services and intellectual property would become primary fields of endeavor and the chief engines of the economy. Now they are, and it is no more rational to deny them equal status than it would have been to confiscate farms, ropewalks and other forms of property in the 18th century. The genius of the framers in making this provision is that it allows for infinite adjustment. Congress is free to extend at will the term of copyright. It last did so in 1998, and should do so again, as far as it can throw. Would it not be just and fair for those who try to extract a living from the uncertain arts of writing and composing to be freed from a form of confiscation not visited upon anyone else? The answer is obvious, and transcends even justice. No good case exists for the inequality of real and intellectual property, because no good case can exist for treating with special disfavor the work of the spirit and the mind. Tenzin Gyatso, the Fourteenth Dalai Lama, appeared on Sunday morning, May 6, 2007, at Chicago’s Millenium Park, Harris Theatre, before a crowd of about 1,500 and taught from a lesson entitled “Eight Verses for Training the Mind,” based on a text attributed to Geshe Langre Thangpa, an 11th century monk. Before addressing the text, the Dalai Lama went over some basic principles, which took about 90 minutes. We heard the Tibetan monks chanting, which imparted a sense of peacefulness throughout the entire assembly. He shared the principles of love, forgiveness, reconciliation, non-violence, and above all: the practice of contentment. He observed that, as participants in a sensory world, that has material limitations, we fall prey to the attraction of greed, and seek contentment in excess, beyond that which constitutes basic necessity. 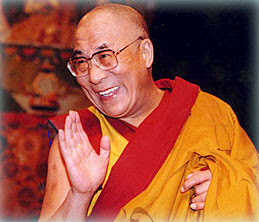 The Dalai Lama provided some basic background for audience members who might not have been familiar with Buddhism and other non-western religious traditions. He pointed out some of the distinctions between “theist” and “non-theist” religions, including the most basic: that non-theist religions, such as Buddhism, have no concept of a creator and no concept of an “eternal soul.” While the philosophies of the various world religions may differ, they lead to the same goals. He said there was no need for people to reject their own traditions. It is possible to have faith in one’s own traditions while having respect for the traditions of others. He warned against the dangers of “attachment” (in terms of emotion, anger, fear) to principles; that this is at the core of the difficulties that occur in religious fundamentalism. It is not “religion” that produces problems, but rather “attachment” that creates the problems we see in the world. At an entymological level, “Buddha” means “cleansing” and “perfection.” All sentient beings have the potential for knowledge, leading to enlightenment, while the basic nature of mind is “delusion and ignorance.” It is thus only by cultivating knowledge that ignorance can be vanquished. Following the Buddha leads to clarity and the disappearance of ignorance. The state of all-knowing can be achieved through practices that reach a state of enlightenment; changes in the nature of the universe – causality, cause and effect – can be achieved. Ignorance and knowledge are contradictory, like hot and cold, like light and dark. These cannot coexist forever. As training and practice take hold, compassion can drive out anger. Emotions exist in this realm: anger, jealousy; the object of these emotions occurs as “bad” and there is no reality in this; it is all the projection of the mind. We all have the potential for “Buddha”-hood. We can all train for this; the tradition is nearly 2600 years old; we can practice compassion; we can practice “emptiness.” Achieving “Buddha”-hood is not possible in this lifetime, but we can begin. The Dalai Lama took us through the eight verses and identified the contributions of Acharya Nagarjuna, an Indian philosopher of the 2nd Century C.E., to whom can be attributed the principle of “dependent origination,” in some ways parallel to the concepts of quantum physics, which itself recognizes the dubious nature of so-called “objective” reality. With this, the Dalai Lama announced that we were finished, and the remarkable session ended to a standing ovation.